You will long for crisp winter air, snowy slopes and the adrenaline of shushing down a mountain after reading these ski tips for beginners, nervous skiers and families. I love the beauty of wintry mountains and I want to give my kids the opportunity to learn to ski while they are young and less fearful than I was when I first tried skiing. I must confess, however, that I have only tried the sport a few times in my life: twice as a young teen and once as a grown-up with my own kids. It’s been a few years since I braved the slopes and I have been feeling some trepidation about skiing again. 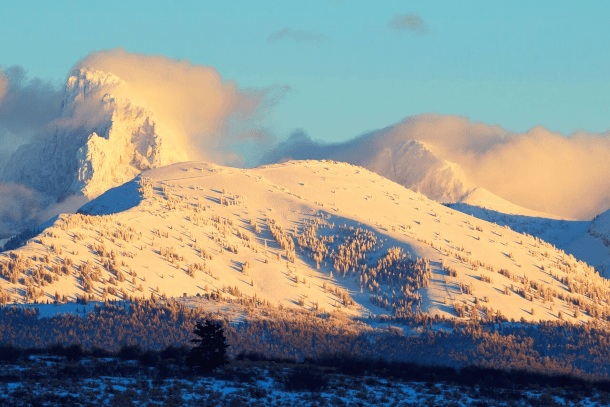 Idaho’s ski resorts and Visit Idaho answered my ski questions and now I can’t wait to embark on another family ski vacation. Read on to find out how to enter to win a ski vacation in Idaho! This post is part of a #ReadytoSki campaign with Trekaroo.com and Visit Idaho to help would-be skiers overcome barriers to giving a ski trip a chance. 1. What tips do you have to make beginner skiers feel more comfortable on the slopes? 2. What’s the ideal ski trip length for a family new to skiing? 3. Do you recommend skiing or snowboarding for beginner adults and kids? 4. What are some tricks for saving money on a ski vacation? 5. 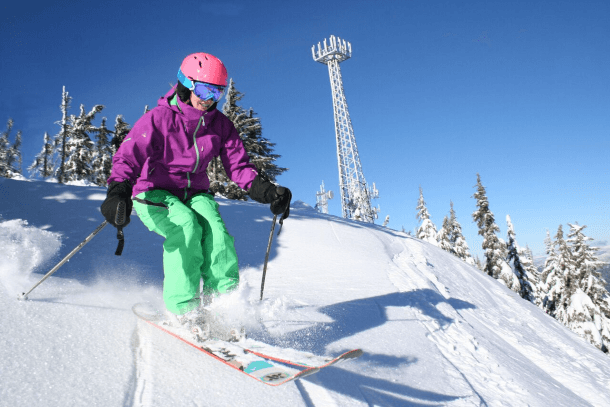 Why should families book a ski vacation in Idaho? 6. How far in advance should travelers plan a ski vacation in Idaho? 7. Which Idaho ski resorts are best for children? 8. Why should a beginner or nervous skier feel comfortable choosing Idaho as their ski destination? 9. What winter activities do you recommend at ski resorts in Idaho beyond snowboarding and skiing? 10. 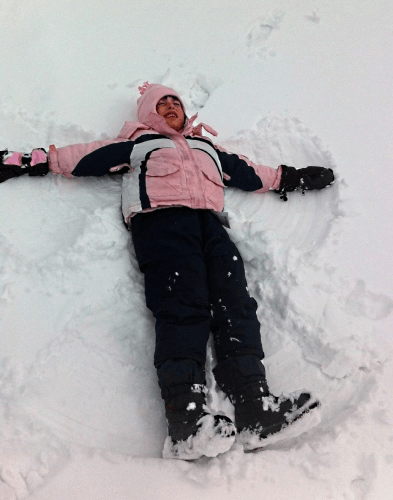 Do you have a sample Idaho ski vacation itinerary for families with kids? Enter to win a ski vacation! All non-skiers should consider taking lessons and asking for a tour of the resort so they know where places – like the ticket office, rental shop, dining options and bathrooms – are located. There are two big keys to feeling comfortable on the slopes. One is having the right gear. Layers are CRUCIAL so that your family members are warm enough when they’re not being super active but can also ‘shed a layer’ if need be. It’s also important to make sure those layers consist of winter-friendly materials. Avoid cotton, which can get wet or sweaty and make you colder. Synthetic materials and wool-based layers will work better. The other key is to make a smart choice about when and where you have your first ski or ride experience. Avoid taking kids out for their first ski adventure in a blizzard or when temperatures are in the single digits. It’s just harder for kids to have fun and focus when they’re uncomfortable. GOGGLES ARE A MUST no matter the weather. The other thing to look for as a parent is an uncrowded environment. It’s so much easier to relax and learn when other beginners aren’t whizzing by and invading your physical comfort zone. That’s why we’re so lucky here in Idaho. Most of our resorts are incredibly uncrowded and that’s a wonderful environment for families. The ideal trip length for a family new to skiing depends on a couple things. Factors would include the attention span of the youngest child and the other activities available in the area. A three-day trip is a good starting point.. You can get an introduction to skiing with a lesson on the first day, then maybe experience some other fun mountain activities (snowtubing, hot springs, snowmobiling if you have older children) and then go back for a second day of ski lessons to build on what you learned the first day. “Muscle memory” is a really important aspect of learning to ski or board, so doing at least two days of lessons can really make things click for your body and your children’s young bodies. This depends on the age of the children. Skiing is generally easier to learn for kids under the age of 6. The strength, motion and balance requirements of skiing just seem to fit their physical development better prior to at that age. Over this age, most kids can pick up either sport pretty easily, so it really depends on which sport the family wants to adopt together. The new ski technology has leveled the playing field with snowboarding in a lot of ways, making it easier to ride powder and terrain park features than in the past, so it’s really a personal choice. Check for specials and promotions and consider traveling on non-holidays. Take advantage of lodging packages, such as stay three or four nights and get another night free found at several Idaho ski resorts. Stay and Play packages are also available at ski areas without slopeside lodging, including Boise, McCall, Sandpoint, Lava Hot Springs, Donnelly and others. 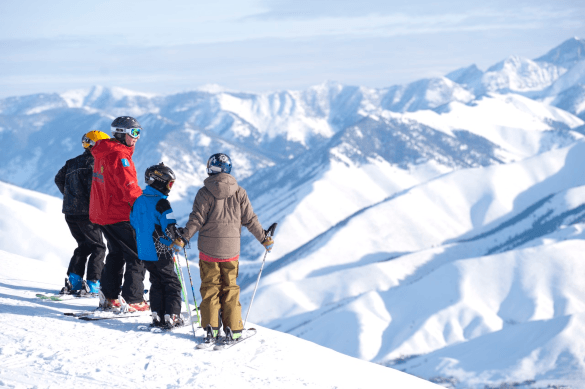 Sun Valley Resort offers a Pre-Holiday Package for a jump on un-crowded slopes and huge savings. 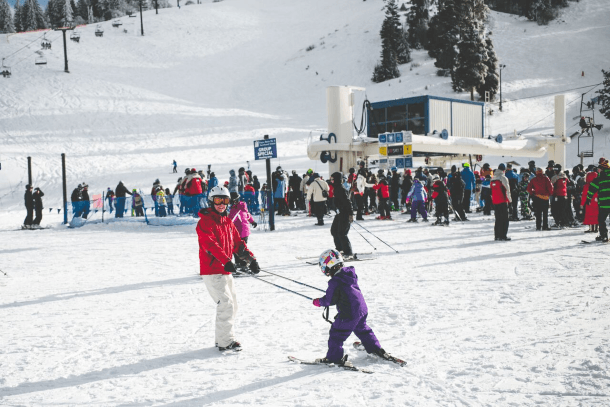 Beginners can ski free at Brundage Mountain Resort! Brundage will offer free lift tickets on its beginner chairlift all season to encourage new people to try the sport. Visitors of any age can pick up a free Easy Street lift ticket at the ticket office any day of the 2015-16 winter season. In Idaho, fifth graders ski for free for three days and sixth graders ski free for three days at participating resorts. A family does not need to live in Idaho to take advantage of the Ski Idaho Fifth and Sixth Grade Passport Program. Idaho’s ski areas are less crowded than many resorts, and less expensive. Also, there are plenty of lodging options to suit all budgets – on the mountain, or in town. Depending on the resort you choose, or the in-town location, you’ll have nearby options for family friendly dining and other entertainment options when you need a break from the slopes. Some ski areas have off slope activities such as arts and craft sessions, snowshoe hikes, movies, game rooms, bowling; and in town the possibilities open up to museums, shopping, indoor fun parks, hot springs and more. As soon as they know they want to go, start the booking process! There are peak seasons where availability in lodging can be tight so if there is even the slightest chance of going during a holiday or school break time, start making plans! Travelers should plan at least two to three weeks ahead of time if they’re visiting during a holiday period to make sure they have a lot of choices before lodging fills up. It’s pretty easy to plan spur of the moment trips in Idaho the rest of the season, which can be great if you want to hit the slopes right after a big storm and enjoy the great Idaho powder. There are several Idaho ski resorts that cater to families and kids, offering lessons, child care, family-friendly dining and off slope activities. 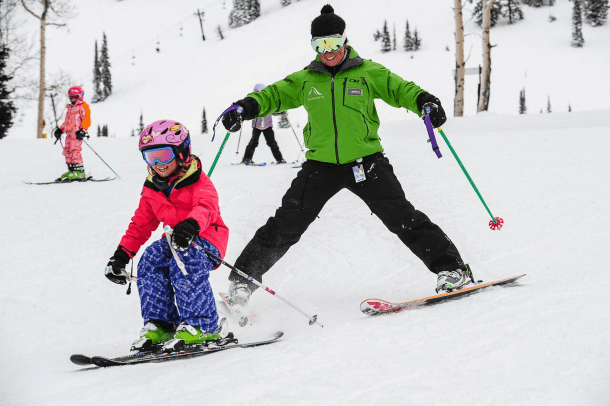 Schweitzer, Sun Valley, Silver Mountain, Brundage Mountain, Lookout Pass, Grand Targhee and even the smaller, local resorts are very family focused, as these are the places our future skiers learn how to ski. Sun Valley was just ranked the #1 Resort for kids by Ski Magazine, and Brundage Mountain was ranked #9 in the West for Families, #10 for Value and #10 for Snow. After a fun filled day on the slopes, what could be better than enjoying the endless summer at Silver Rapids Indoor Waterpark, where it’s always a tropical 84 degrees? And there are hot tubs for the parents to relax and watch. Silver Mountain offers a Splash & Stay Package (lodging & water park); a Ski, Surf & Stay Package (ski, water park, and lodging) and a Snow & Splash Package (water park, tubing hill, and lodging). Grand Targhee Resort offers Kids Night Out: You love your kids, but parents need a break, too! Grand Targhee Resort’s licensed childcare center is the perfect place for children ages 2 to 12 years of age who need some after hours care while parents enjoy an evening out. Care providers will keep your children entertained with dinner, star gazing, crafts, and other fun activities. Grand Targhee also has a special slopeside area for kids, the Kids Fun Zone. Located off of the Shoshone lift this terrain is dedicated to families, first time skiers or riders, lessons, and children. We developed terrain based learning features that build skills, balance, and confidence in a safe environment. The Idaho ski areas are committed to the sport. They go out of their way to welcome skiers to the fold and that includes families. They want families to experience skiing and to love the sport as much as they do, so they make it fun and easy. We heard from visitors that skiing in Idaho is hassle free — easy access, no lines, affordable, not too touristy…the whole experience was simple and fun. And we have lots of skiable acres so there is plenty of room to spread out reducing crowded slopes and parents’ fears of having little ones knocked down. Idaho Olympians come back to Idaho, so we must be doing something right. Cross country skiing and snowshoeing are very popular and snow biking is also becoming an asked-for activity. 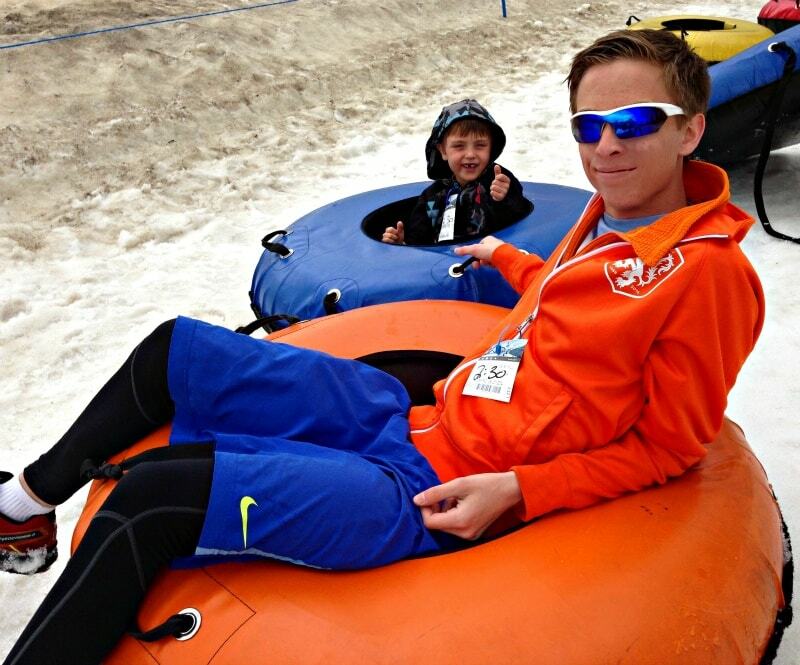 Snow tubing is also great for families. The Sun Valley Resort has ice skating, sleigh rides, a bowling alley and arcade, and a spa, in case there is time for a mommy-daughter manicure. 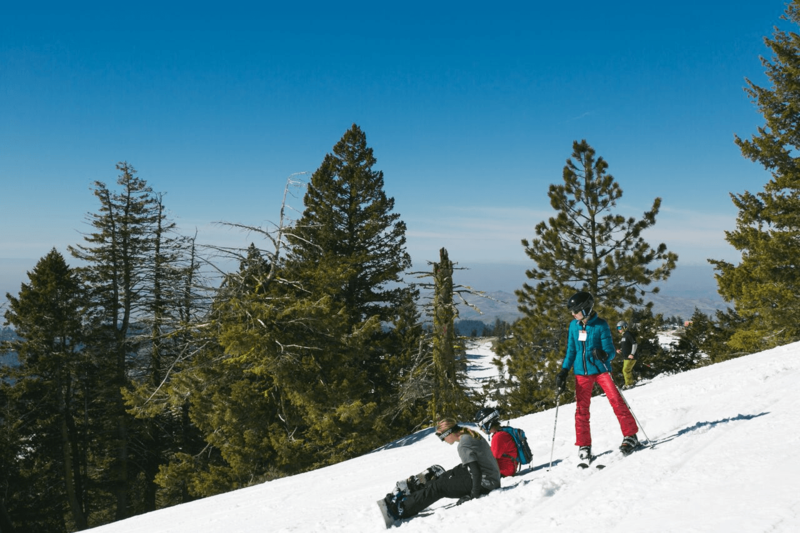 Bogus Basin Mountain Recreation Area has a tubing hill as well as snowshoe and nordic trails. Schweitzer Mountain offers tubing, snowshoe hikes, and Nordic skiing. All start from the village and are great for all ages. Schweitzer also shows free movies in the Selkirk theater, and families can enjoy the hot tubs and the outdoor pool. Schweitzer also has a spa for a relaxing change of pace. At Brundage Mountain they have a snowshoe trail and snowshoe rentals available, so that’s a really fun thing for families to do. Brundage also manages the Activity Barn just 10 miles away in the town of McCall. The activity barn offers snowtubing, a rail park and beginner lessons. Day 1: Get acclimated with the resort and check out all the amenities. Take youth and/or adult lessons. Day 2: Take another round of lessons and/or spend the half/all day enjoying amenities: snowshoe hikes, zip lines, ice skating, bowling, arcade games, swimming, hot tub soaks, and more. Rest the muscles. Day 3: Spend family time together skiing the slopes, gaining confidence and making memories. 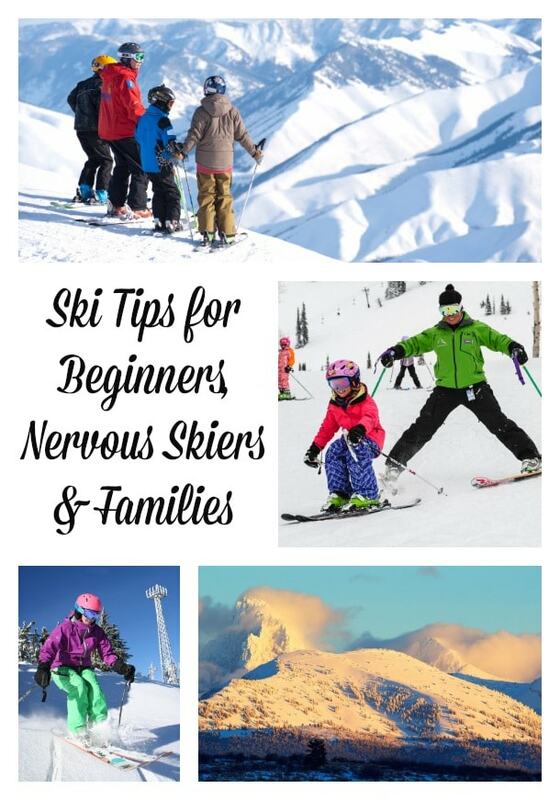 For more ski tips for beginners, nervous skiers and families – check out #ReadytoSki on Trekaroo.com. 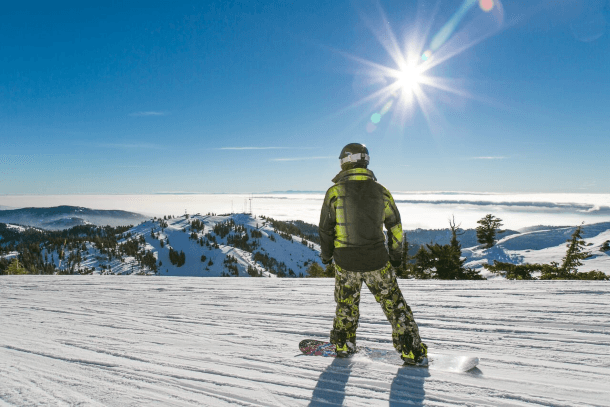 You could win a ski vacation in Idaho including four lift tickets to Bogus Basin Mountain Resort and a two-night stay at Riverside Boise ($500 prize value). Or, you could win a ski vacation to Smugglers Notch in Vermont featuring three nights for a family of four in a two-bedroom mountainside condominium and three days of lift tickets during a non-holiday time period. (Valid December 4, 2015 through April April 10, 2016 except during holiday periods. $1000+ prize value) Enter now! I’m feeling jazzed up to book a ski trip with kids! How about you? A Note from The Travel Mama: This post is part of a paid campaign. All opinions are mine, as always. Glad to hear it, Katie! I hope you’ll take the family ski trip leap – I bet you’re kids will love it! I’m definitely a nervous skier, but hope to change that this year! Me too, Tamara, on both accounts! Maybe we’ll see each other on the slopes this year?! I’m a beginner so this post was very helpful! I can’t wait to try it for the first time! So glad you found the tips helpful, Lori! So true. I will definitely think of Idaho for a future ski vacation now that I’ve learned about all they offer. Plus, Ernest Hemmingway’s grave…who knew?! Vermont has a similar passbook program for 5th graders allowing them to ski for free. Good to know! Thanks, Karen! I haven’t been skiing in a long time. This has reignited my passion that’s for sure! Yay for reigniting the skiing passion! Thanks for the comment, Jess. Now that my oldest is at college it’s not easy to get the family together, that’s why ski vacations are so awesome. Can’t wait till our next family ski getaway! I’m learning to ski, so I’m very nervous still. Good post! Jpata – Once you get out on those gorgeous slopes with an instructor, everything will come into place. Enjoy! I’ve been skiing a few times and, honestly, it’s not my favorite thing to do. I just don’t feel very confident on skis! However, if it means getting to return to Idaho, I’d give skiing another go!